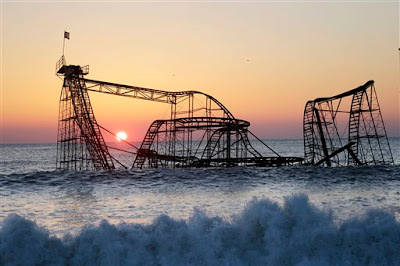 Workers have begun demolition on New Jersey’s Jet Star Roller Coaster. The coaster was hit off of the pier and into the ocean by Hurricane Sandy last October. The picture of this coaster sitting in the sea served as a representation of the devastation that Sandy caused. Construction, or rather destruction, was delayed for months as contractors needed to decide the best way to remove the coaster. They eventually chose to remove it by bringing in a barge with very large crane. Removal began on Tuesday, and was set to be finished within 48 to 72 hours. The rest of Casino Pier, the amusement park where the Jet Star was located, is being rebuilt. They will have 18 rides, including a new pendulum ride, and are set to open this summer.